Our product range includes a wide range of pigment printing paste and textile pigment emulsion. 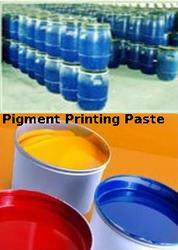 We are one of the renowned manufacturer and exporter of a wide variety of best quality Pigment Printing Paste. We offer these emulsions in powder as well as paste form. We are one of the prominent manufacturer and exporter of a wide variety of premium quality Textile Pigment Emulsion including Organic Pigment Emulsion and Inorganic Pigment Emulsion. We offer these emulsions in powder as well as paste form. These emulsions are tested on various quality parameters before supplying to the clients to meet the industrial standards. Also, our products are available at industry leading prices. Looking for Pigment Emulsions ?